Blowout Sale! Save 75% on the Network Switcher 4 Port, 4-Port 10/100Mbps Network Switches Desktop PoE Switch with Durable Metal Housing, four 15.4W PoE Ports, Plug and Play, for Security Camera System, CCTV IP Cameras, Wireless AP by SANNCE at AABX. MPN: JHJ008-U#NUSO. Hurry! Limited time offer. Offer valid only while supplies last. 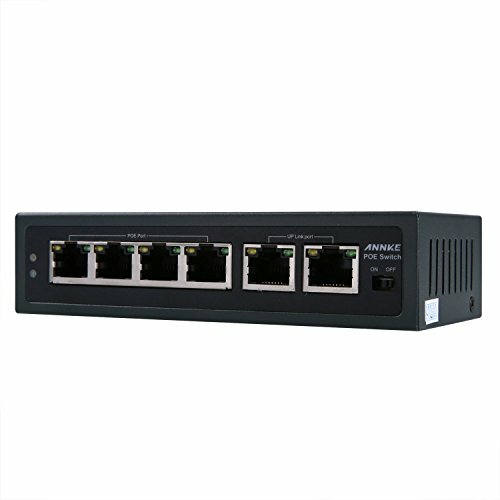 √ √10/100Mbps 4-port desktop PoE switch works with IP security cameras, wireless AP, and other standard PoE enabled devices. 4 PoE ports + 2 Uplink ports at 10/100Mbps. √ √Effortless CCTV mode, it lowers the transmission speed to the max. 10Mbps per port in order to enhance the transmission distance to 250m approximately. √√ Supports the maximum 30w PoE power and 100Mbps transmission speed for each port. PoE allows data and power to be transferred through a single Ethernet cable at the same time. √ √Complies with IEEE802.3, IEEE802.3u, IEEE802.Saf and IEEE802.3at standards; PoE meets End-Span. Can be used as a normal network switch or PoE switch. √ √Superior lightning protection up to 2.5KV, excellent ESD protection and anti-interference ability. Metal housing, compact desktop size and durable quality. If you have any questions about this product by SANNCE, contact us by completing and submitting the form below. If you are looking for a specif part number, please include it with your message.